Preliminary experiments in western blot gave no signal but low background in human brain and liver lysates at up to 1 µg/ml. 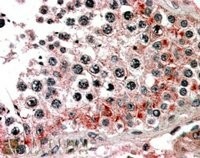 We would appreciate any feedback from people in the field - have any results been reported with other antibodies/lysates? Peptide ELISA: Limit dilution 1:64000. Immunohistochemistry: 3-5 µg/ml. In paraffin embedded Human Testis shows vesiculate cytoplasm staining of primary spermatocytes. The membrane associated protein encoded by this gene is a member of the superfamily of ATP binding cassette (ABC) transporters. ABC proteins transport various molecules across extra and intra cellular membranes. ABC genes are divided into seven distinct subfamilies (ABC1, MDR/TAP, MRP, ALD, OABP, GCN20, White). This protein is a member of the MDR/TAP subfamily. Members of the MDR/TAP subfamily are involved in multidrug resistance as well as antigen presentation. The function of this half transporter has not yet been determined; however, this protein may play a role in lysosomes. Alternative splicing of this gene results in three known products which are likely to have different substrate specifications. Zhang F, Zhang W, Liu L, Fisher CL, Hui D, Childs S, Dorovini-Zis K, Ling V.
Characterization of ABCB9, an ATP binding cassette protein associated with lysosomes. J Biol Chem. 2000 Jul 28;275(30):23287-94. Store at 2 - 8 °C for up to one month or (in aliquots) at -20 °C. Avoid repeated freezing and thawing. This antibody detects ABCB9 at C-term.